Concord, New Hampshire—With the choreographed precision of a giant amoeba, the crowd of blue-shirted Mitt Romney supporters stopped listening to the speaker on the stage and squeezed its way toward the Tea Party Express bus. A moment later, as the former Massachusetts governor parted the blue sea of about 40 cheering fans—many bused in from Massachusetts—to deliver his speech at the much-ballyhooed Tea Party event on Sunday, the blue shirts erupted into rapturous applause. 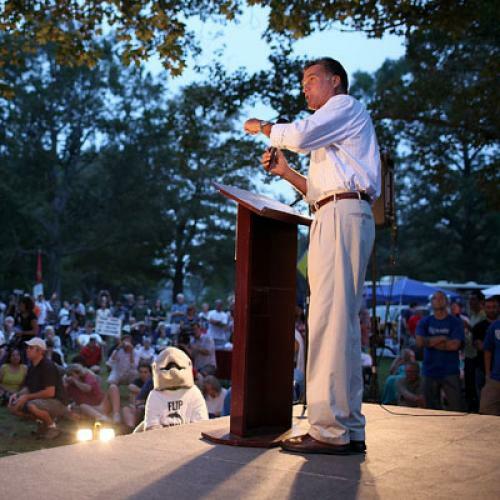 In the days leading up to the rally, pundits had trounced Romney’s decision to speak in Concord as a shameless effort to pander to the Tea Party, not to mention a desperate move to save his flagging campaign. Nationally, some Tea Party groups threatened a protest. But only about ten such protesters made it to the rally, many of whom were from FreedomWorks, the DC-based group that had first issued the threat. Indeed, most of the assembled couldn’t care less that Romney might have been pandering, as long as he was finally beginning to pander to them. But if New Hampshire’s Tea Partiers came to the event with a surprisingly open mind, Romney’s insular campaigning style soon confirmed all the deepest-held suspicions that they harbored about the man and his candidacy. Instead, Romney delivered a stump speech. “I believe in free enterprise,” he told the crowd. “I believe in the Constitution, all of the amendments.” After twelve minutes of speechifying, including a word cloud that included the Constitution, freedom, and states’ rights—he was done. There would be no questions, no back and forth, no chance for his detractors to press him on points of contention. Romney’s blue shirts quickly surrounded him once more as he left the stage, helping him make his escape to a waiting ivory SUV. When I tried to get a question in, it was quickly shot down by one of his handlers, who put out his hand and informed me that “he’s not doing any interviews.” “Thanks for coming out,” said Romney, who never broke stride. Melanie Plenda is a freelance reporter based in New Hampshire.